Faint planets orbiting distant stars are by nature challenging to find, and long eluded detection. But since 1992, when Polish astronomer Aleksander Wolszczan first confirmed the existence of an extrasolar planet, the numbers we've found have snowballed. Now, NASA's next-step missions aimed at understanding the Milky Way's apparent abundance of worlds are on the horizon. The Transiting Exoplanet Survey Satellite (TESS) and James Webb Space Telescope (JWST) promise to be powerful tools in the discovery of new exoplanets, and will allow us to study their physical characteristics in far greater detail. The most common type of exoplanet is between one and two times the size of Earth. The effects that distant exoplanets have on their stars -- the wobbling motion caused by their gravitational tug as they revolve, or the subtle dimming of starlight as they pass in front -- have long been our primary means of getting to know these far-off worlds. Not surprisingly, the first exoplanet discoveries were of gas giant planets like Jupiter and Saturn -- planets that orbit close to their stars so their telltale influences are more pronounced, and easier to detect. On March 7, 2009, NASA's Kepler spacecraft launched on an ambitious campaign to search for Earth-sized exoplanets orbiting their stars at moderate distances. That is, distances where conditions are right to support the presence of liquid water, the indispensable elixir of life as we know it (that is to say, Earth life). Before a series of unfortunate mechanical failures in 2012 and 2013, Kepler focused on a narrow patch of sky near the constellation Cygnus, observing stars ranging from a couple hundred to almost 8,000 light years away from Earth. To date, astronomers have confirmed a total 1,827 exoplanets, more than a thousand of them detected by Kepler. And there are more than 4,600 Kepler candidates still awaiting confirmation -- impressive results for only a few short years of observations. In total, about 30 exoplanets, all between one and two times the size of Earth, have been ranked as potentially habitable planets! With Kepler partially on the fritz (though reinstated as Kepler 2.0, and now on a mission adapted to its handicapped status), we can look to NASA's TESS and JWST missions to advance us to the next step in our exploration of exoplanets. TESS, scheduled for launch in 2016, will cast its eye closer to home than Kepler. Where Kepler observed a narrow, cone-shaped swatch of the Milky Way galaxy extending thousands of light years, TESS will target stars that are 30 to 100 times brighter -- and consequently, mostly closer to us -- than Kepler's subjects. One of Kepler's revelations was that the most common type of exoplanet is between one and two times the size of Earth. Science fiction stories dating back many decades preferred these Earth-style planets over gas giants like Jupiter or diminutive dwarfs like Pluto; the planets usually hosted characters who needed solid ground to stand on, and temperate, breathable air to sustain them. 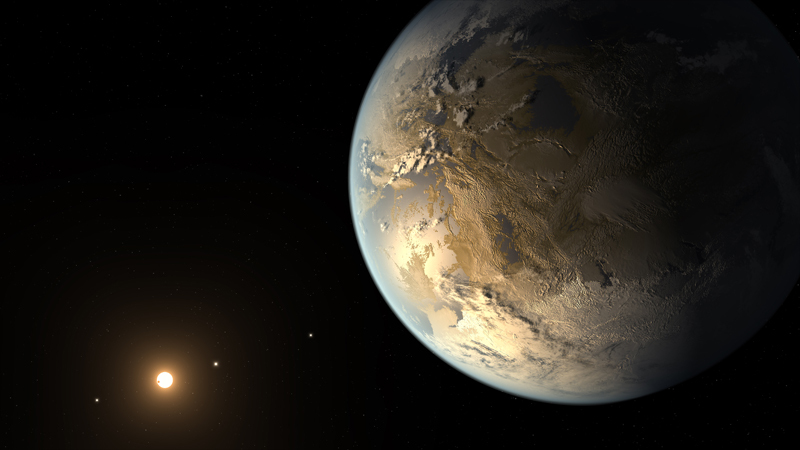 Science looks to Earthy exoplanets as the most likely places to find signs of life. How exciting to learn that both science and science fiction have been rewarded for their visions! 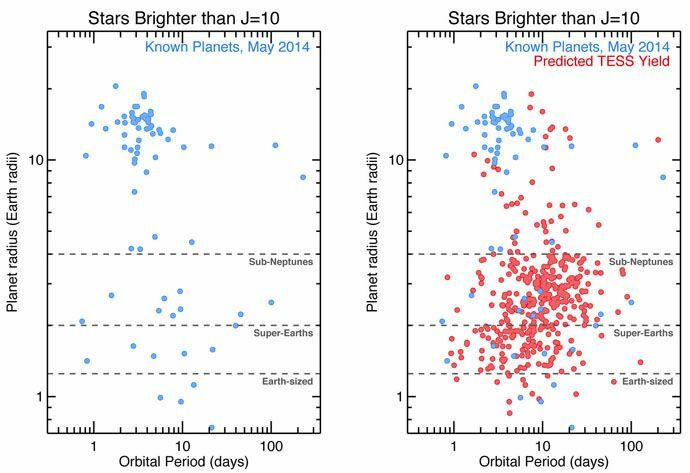 Kepler's exo-Earth finds, however, mostly orbit distant and often faint stars. So beyond being a good source of statistical data that has informed us of the abundance of exoplanets in our galaxy, there's been little opportunity to follow up with more detailed measurements or characterization of their physical properties. In most cases, they're just too far away to tell us much more than their approximate sizes and orbital periods. TESS, on the other hand, should yield a catalog full of transiting exoplanets located around the brightest and nearest stars in the galaxy -- close enough for large telescopes, on the ground and in space, to conduct follow-up analysis. JWST, the infrared-wavelength successor to the Hubble Space Telescope, is scheduled for launch in 2018 and will be a powerful tool in exoplanet investigation. 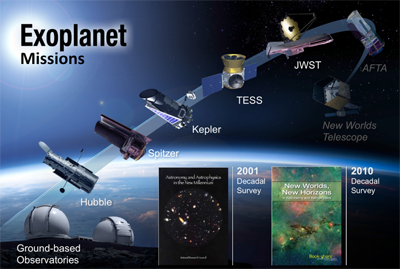 Not only will the JWST study exoplanets by the conventional measurements of star-wobble and exoplanet transits, but unlike Kepler and most other observatories, this space telescope will make direct observations of exoplanets. JWST will carry an instrument called a coronagraph, which blocks the light of a star and allows the relatively much fainter infrared emissions of an orbiting exoplanet to be detected and analyzed. Using that information, JWST will be able to determine a range of physical characteristics, including an exoplanet's color, rotation rate, differences between summer and winter, weather patterns, and possibly even vegetation. Only some six decades ago, we didn't even have a good understanding of what nearby planets like Venus, Mars, and Jupiter are like. Now, we're examining planets many light years away, in other star systems, with enthusiasm, hopeful expectation and burgeoning imagination.